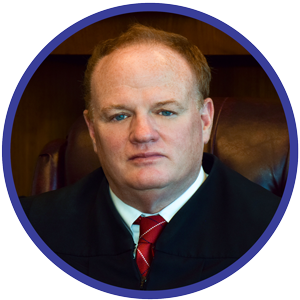 Andrew J. Gleeson is the Chief Judge of the 20th Judicial Circuit for the State of Illinois which comprises Monroe, Perry, Randolph, St. Clair and Washington counties. Judge Gleeson presides over major civil jury and bench trials. He has presided over complex jury trials in the major Civil Division for eight years. Gleeson was nominated and elected to the position of Chief Judge by his fellow judges in 2016. As Chief Judge Gleeson is responsible for the general administration of the 20th Judicial Circuit Court, which includes assigning cases and creating specialized divisions within the Circuit. Gleeson has served as a Judge since 2003, first appointed as an Associate Judge then elected as a Resident Circuit Judge in 2012. Prior to joining the 20th Judicial Circuit Court, Judge Gleeson was the Chief Public Defender in St. Clair County and was engaged in the general practice of law for 18 years. In addition to his judicial duties, Gleeson is an adjunct professor at Southwestern Illinois College in the Paralegal Studies Department. He is past president of the St. Clair County and East St. Louis Bar Associations. Judge Gleeson was nominated as a 2017 McCormick Foundation Executive Fellow, a program designed to provide highly influential leaders from multiple sectors with a credible, up to date and research-based understanding of child development. He is presently Chairman elect of the Article V Committee of the Illinois Supreme Court. Gleeson’s parents, Jim and Kitty Gleeson, were lifelong educators in the area. Growing up in East St. Louis and Belleville, Illinois, Gleeson is a lifelong resident, attending Althoff Catholic High School, University of Notre Dame and Saint Louis University School of Law.